As much as I would like to tell you that I am the perfect cook, I am not even close. Just last week I was steaming an artichoke and got distracted. Before I knew it, the water had evaporated in the pan and I burnt the entire pan to a crisp. Don't worry, my artichoke survived but my pan suffered a major blow. 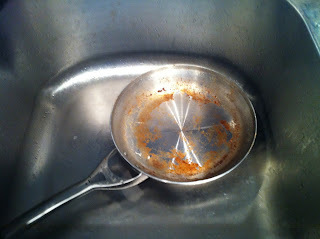 After I cursed and said, "I can't believe I did this again," I scrubbed the pan furiously with no result. I took to the internet to find a home remedy on how to clean a completely burned pan. I first used baking soda and soaked the pan overnight. Unfortunately this did not even break through the char. At this point I was feeling defeated but I did not want to give up because the last thing I wanted to do was spend money on a pan. I registered for nice pots and pans when we got married but I would never treat myself to these pans on my own dime. After scouring thru hundreds of remedies, I finally found the perfect solution. TIDE!!!! Fill the bottom of your pan with liquid Tide and a small amount of water, soak overnight, and the next day your pan will be as good as new. Of course I forgot to take pictures last week of my burnt pan to show you the before and after. You will just have trust me and try this remedy if you do something as clumsy as me in the kitchen. This week, I attempted to sear salmon (yes it was a flop) and in the process my pan was filled with thick burnt residue (did not compare though to the burnt artichoke pan from last week). The picture below does not do it justice but soap and water would not take it off. 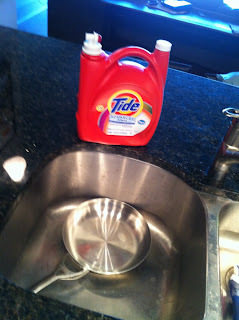 Once again, I poured some TIDE on the pan and let it soak for an hour. I had to soak the artichoke pan overnight because you could not even see the bottom of the pan because it was black. Anyways I washed all the residue right off and I had my beautiful frying pan back! Check out the results! I feel sorry for your pan :). Better luck next time!! If you are burning your salmon, it sounds like you need more 'EVOO' - this coming from the salmon expert (one of my 2 specialties) :) Try a little honey Dijon or sweet teriyaki glaze. Mmmmm.